Generations of Pittsburghers have made plans by telling friends and family, Meet me under the Kaufmann’s Clock. Future generations will be able to do the same — and much more — when a Philadelphia real estate company completes its $100 million rehab of the iconic Macy’s/Kaufmann’s building Downtown to house luxury apartments and a hotel. The first residents will move in at the end of December while crews finish work in the building. Though the building was a Macy’s after Federated Department Stores purchased the store started by Edgar J. Kaufmann, “No matter where we went, all we heard was Kaufmann’s,” said Samschick, whose company bought the property after the store closed in 2015. 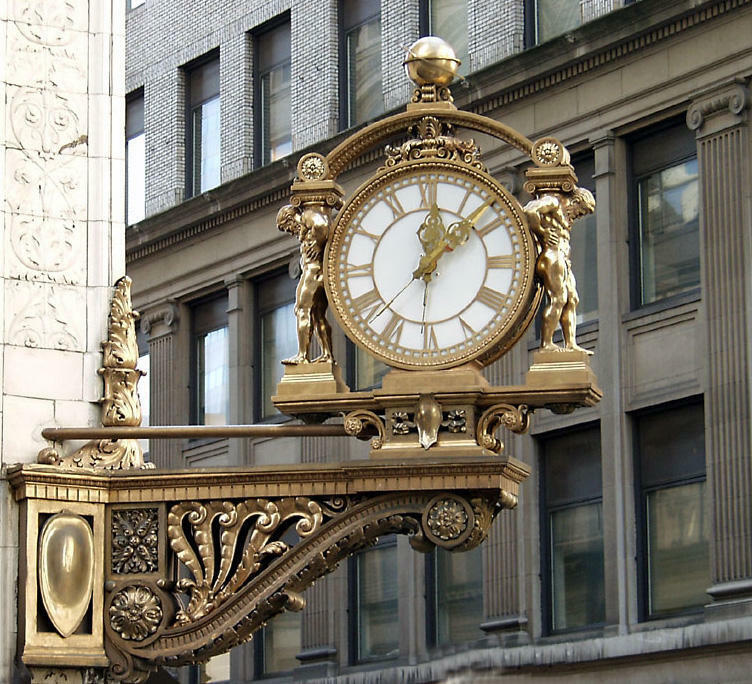 Its bronze clock, part of the facade at Fifth Avenue and Smithfield Street, has been a landmark meeting place since 1913. Preserving history is clearly an emphasis, but the future was on full display at Kaufmann’s Grand during a VIP tour of the property for Mayor Bill Peduto and other guests. First stop: The ninth floor, one of six top floors of the 13-story building that will house 311 apartments. Apartments inside the former department store will be equipped with Amazon’s voice-activated operating system. Photo by Chris Togneri. Through a partnership with Amazon, every apartment is equipped with Alexa, its voice-activated operating system, that allows residents to make coffee, raise or lower the window blinds, adjust the temperature and turn on the television — all without getting out of bed. “Alexa, turn on home lighting,” a Core official said, and the lights came on as Samschick led Peduto into a one-bedroom unit. A similar request opened the blinds to reveal a view of an atrium below. “OK,” a voice answered, and soon a pot of coffee was ready. 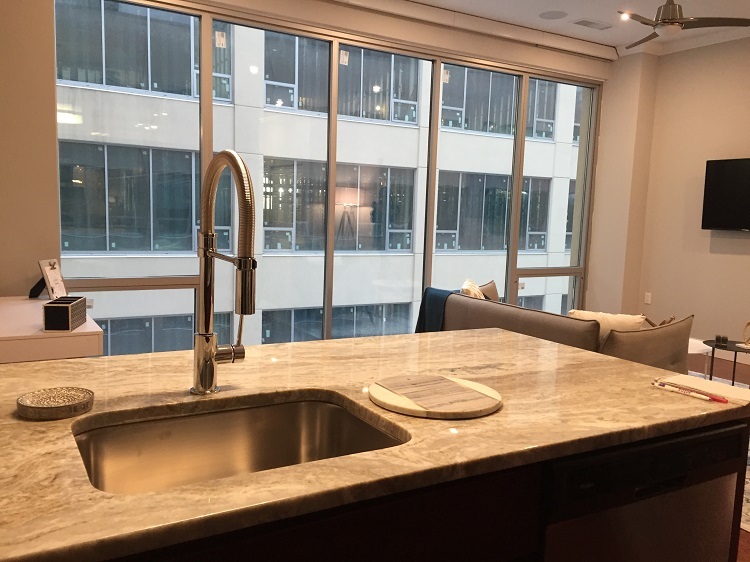 With floor-to-ceiling glass walls and open-concept floor plans, the apartments will rent for $1,150 to $2,500 a month. Core is building 65 studios, and 175 one-bedroom and 71 two-bedroom apartments. 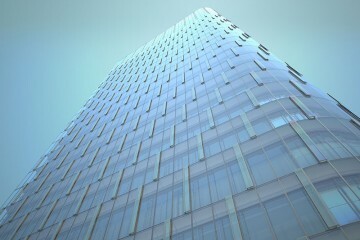 Several floors down, EVEN Hotels will soon finish its accommodations. Developed by InterContinental Hotels Group, the EVEN brand focuses on providing “wellness” features such as access to healthy food, exercise and restful sleep options. The dingy, dark space off the lobby of EVEN Hotels will become an outdoor park inside the building. Photo by Chris Togneri. 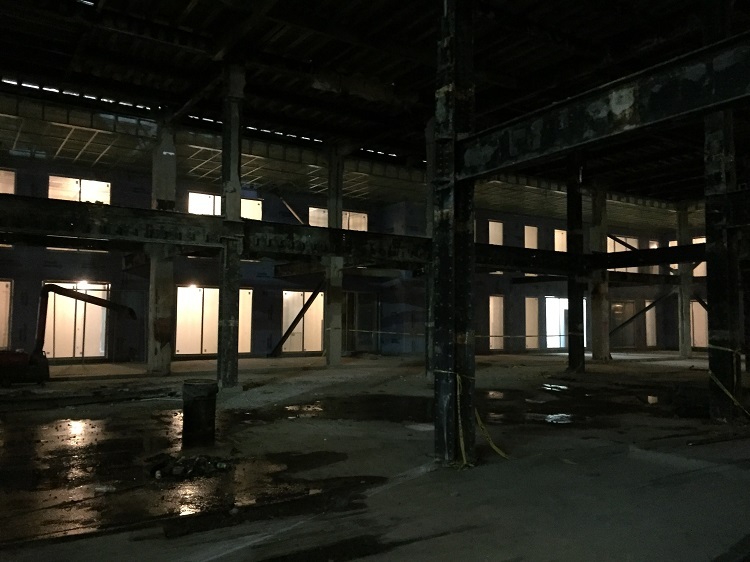 Off of the lobby, a warehouse-sized room still has exposed steel beams; water drips from the ceiling. In a matter of months, however, this space will become an outdoor park – entirely within the building’s footprint. Walls will surround it, but crews will remove the floors above so the space becomes open-air, Samschick said. They’ll install trees and other greenery, and create a space for dog walking and sunbathing. “We feel it will be a powerful, impactful environment,” Samschick said. The park will be available to rent for weddings and other events, but otherwise will be accessible to hotel guests and Kaufmann’s Grand residents, unless EVEN decides to also grant public access, Samschick said. He would not name potential tenants who have expressed interest in the retail and office space being developed on the first and second floors, but said Core has received four letters of interest. The decision on who leases space will be determined by services and products that would best serve residents, hotel guests and visitors, he said. A parking garage with more than 600 spaces will occupy the third and fourth floors. The rooftop — for residents only — will feature a tennis court and an infinity pool, so swimmers “will really feel like they’re going to swim off the side of the building,” Samschick said. The Kaufmann’s Grand project is important for the city not only because it saves a building with which many Pittsburghers have an emotional connection, but also because it will spur more redevelopment along Smithfield Street, a vital business corridor, Peduto said. 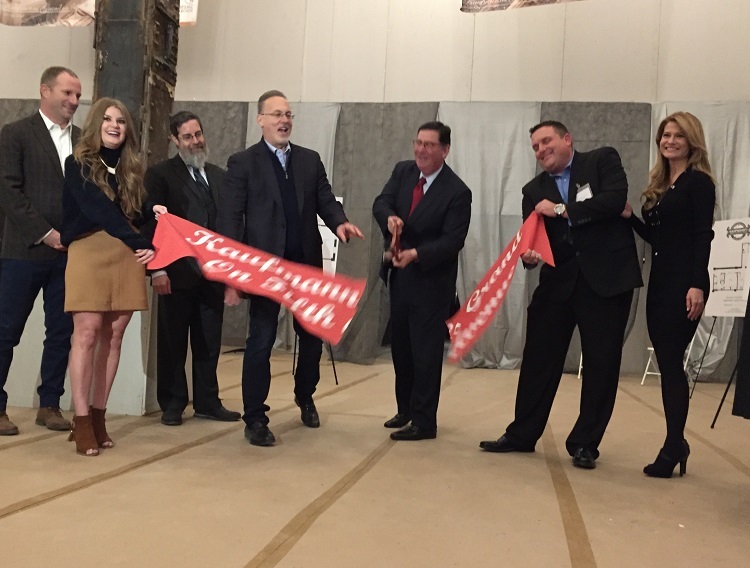 Pittsburgh Mayor Bill Peduto cuts a ribbon with officials from Philadelphia-based Core Realty before a VIP tour of the Kaufmann’s Grand on Fifth. Photos by Chris Togneri. Kaufmann’s “is a place that has memories for a lot of people, from weddings and celebrations, [and] it’s going to be around for a long time,” Peduto added. The building at the corner of Fifth and Smithfield dates to 1887. Core began renovations in the spring of 2016 and expects to finish construction next spring. 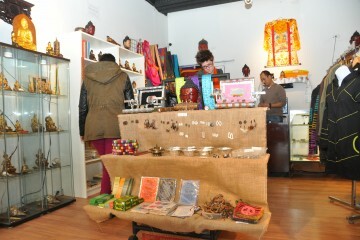 Samschick said he fell in love with the building for its appearance, craftmanship and history. He learned later of the bond city residents have formed with it. “Everyone here seems to have an emotional connection to this place,” he said. That’s why he turned down someone’s offer early on to purchase and remove the famed Kaufmann’s Clock at the building’s north-facing corner. Had he sold it, Samschick said, he would have been run out of town. “It will never go anywhere,” he said.